Espinho Commune has no proper symbols and shares those from the municipality. 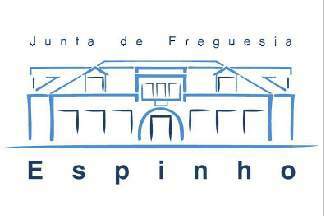 Here all local coats ot arms are displayed except Espinho, which has a logo, probably displaying the council's building in blue lining and a blue inscription as follows "Junta de Freguesia" (top, smaller) "Espinho" (bottom). Here you can see the local administration building, only hoisting the flags of Portugal, Europe and the municipality. Espinho Commune is one of the four communes of the Espinho municipality (q.v. ); it had 9832 inhabitants in 2011 and covers 1.8 km².